Sometimes when I am wrestling with a chapter (psst, like now), I wonder who am I to teach writing or pretend that I know anything about writing at all? Why would anyone listen to me when I can't figure out a character or when I stare at a page for hours on end and the best I can come up with is: She opened the door. Or: "No," he said. Sometimes, I can figure out the problems for other people. Every writer should look at other writers' pages, because being able to look clear-eyed at a piece of work and be able to tell what works, what doesn't, and why, can really nudge you into figuring out your own writing. Plus, it makes you feel smart, which leads to feeling more confidant, which leads to more writing and perhaps a bit more forgiveness of the whole thorny and wonderful process. 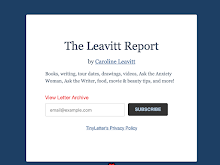 I want to mention a fab new site for literary women, She Writes. Dedicated to helping women writers thrive as professionals and as artists, She Writes is also a sort of literary salon. 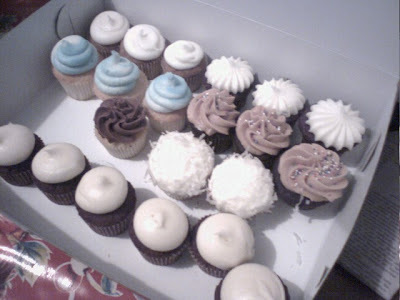 Behold these beauties from Sweet, my favorite cupcake place in the world, which just happens to be two blocks away. This means it is often dangerous to walk on that particular block, because these cupcakes have their own siren song. These fabulous cupcakes (red velvet, banana, chocolate, coconut, vanilla, coffee, peanut butter, ginger, some with marshmallow, cream cheese and buttercream frostings) were a gift from Gina Sorell, a former UCLA writing student of mine (and now a friend) who just got an agent for her novel! What is so amazing for me is that I saw the novel in its babyhood. I got to watch it grow and stretch and become something alive and rich. And now I get to celebrate with Gina. I thanked her profusely for the cupcakes, and I told her, as I truly believe: structure can be taught. All the nuts and bolts of writing can be passed on like an heirloom. But Talent--well, it cannot. Teachers, mentors, brilliant agents and editors guide you in the right direction to shore, offer life boats or new ways of swimming, cheer you on and make you better than you could ever imagine, but in the end, you have to do the strokes. I'm just thrilled for Gina. She had the goods all along. And now I have the baked goods and they are most delicious. I can't pass up a book about Virginia Woolf. 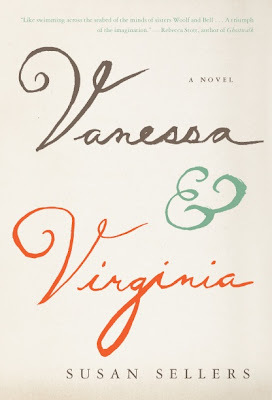 Vanessa & Virginia, about the sister's lives, is ravishing, literate, and fascinating. Susan Sellers, a professor of English at St. Andrews University in Scotland was so very gracious in answering my questions. You’re a respected Woolf scholar, but why write a novel about Vanessa and Virginia? What was the impetus? Some of my fascination came from research. I manage a scholarly edition of Virginia Woolf’s writing and this led me to read not only her novels and essays, but also her diaries and letters. We know an extraordinary amount about Virginia Woolf and her sister Vanessa Bell. And yet, there are gaps in what we know. Fiction enabled me to explore these gaps. It also allowed me to go inside the minds of both sisters, and to imagine what they were thinking and feeling. The rivalry between the two sisters is palpable. I was wondering what elements did you bring to the novel that are not specifically factual? I had a strict rule to myself when writing the novel that I would not contradict any definite fact. On the other hand, as I’ve suggested, I wanted to explore some of the gaps in the story, and here I gave myself permission to invent. I see this as a feminist enterprise – filling in the blanks and omissions in the historical record. I know that I brought some of my own life-experience to the sisters’ relationship. I’ve always been fascinated by the way our early dealings with our siblings mould who we are and continue to resonate in our adult relationships. Like Vanessa Bell, I’m the eldest in my family and could empathise with Vanessa’s sense of responsibility towards the younger Virginia – as well as her pleasure in and at times intense resentment of her sister’s success! The honest answer is that I was too terrified of sounding like a poor pastiche of Virginia Woolf to attempt to write in her voice! Once I knew I would tell the story in Vanessa’s voice I began to see all sorts of advantages. For instance, it made it possible to give what I hope is a multifaceted portrait of Virginia: brilliant, risk-taking, intense, but also at times uncertain and needy. I think this would have been more difficult to do if I had been writing through Virginia. The flashback structure offered great economy because Vanessa could select certain incidents rather than attempt to be all-inclusive and could also alter the chronology. This was important because some of the things that happened would have been hard to include sequentially in a novel, where as a writer you are thinking about pace, balance, contrast and so on. From this vantage point the most difficult part of the story was during the 1890s when the sisters lost first their mother then their half-sister Stella. This double tragedy would have been very difficult to handle if I had been telling the story in strict chronological order. I also found it fascinating that it is the painter, and not the writer who does the narration of the story. What do you think painting has to say about writing and the creative process in general? To prepare Vanessa, I spent time watching artists work and became fascinated by the way a painting is built up, brush-stroke by brush-stroke. This seemed to me a perfect metaphor for the role art played in both women’s lives. Scarcely a day went by when the sisters did not paint or write, and I think this incessant act of creation is one of the most empowering aspects of their story. No matter how difficult their lives were, they continued working. This is all the more remarkable when you think of the turbulent times they lived through – they experienced two world wars, tremendous political, social and technological change (they were the first generation of women to have the vote in Britain and Virginia wrote one of the first essays in the English language on cinema), and of course intense personal tragedy. What was your whole writing process like in completing this book? One very important impetus for the novel was a long period of research leave away from my University. This gave me time to write the first draft without the persistent interruption of work. After that, it was more difficult, because subsequent drafts had to be fitted around other commitments. For me, writing requires daily or near-daily space. I think you have to carry the world of your novel around in your head with you while you are working on it, and this is difficult to achieve if you have too many other demands pressing in on your time. I’m writing a novel about the contemporary London art world and about that moment in a woman’s life when she realises she may have left it too late to have children. The story is told partly from her point of view and partly from that of her (male) partner, so it also explores the impact childlessness can have on men. I’m very glad you didn’t ask me to recommend my favourite books because I always find that very hard to answer! Vicki Abelson is amazing. A one-time publicist and promoter, she gave it up to be with her kids and started writing. Realizing how important it is to read work-in-progress aloud, and like most of us with kids, not having the evenings available to get out and do it, she created a daytime alternative in 2008, Women Who Write. Women Who Write, now in LA and NYC, presents readings for women, by women, monthly, mid-day soirees, which feature four professional writers and are open to all women who love being read to, welcome engaging discussions and relish feasting on delectable fare. She's had Rachel Resnick (I raved over Resnick's Love Junkie here a while ago), Evan Handler of Californication, and more. Says Abelson, "Most thrilling of all, is offering a nurturing forum for writers to read, and a safe heaven for all of us to give voice to our truths. For three hours ever month, in a Montrose living room, together we construct a magical communion of mind, heart, tummy and spirit, that profoundly and deliciously unites and nourishes us." For more info, check out Vicki on Facebook, which she points out, is hugely responsible for her connecting to so many great writers! 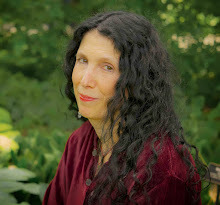 Please check out the fabulous posts about the writing life from author Clea Simon at the amazing Kepler's Writer's blog! This writers blog is an amazing resource for writers and for readers and gives an intimate look inside the writer-mind. What is so funny for a novelist is that we have to do research, even though our greatest pleasure is making things up, creating worlds, and flying by the seat of our pants. I spent a lot of time researching open adoption for Girls in Trouble (the results didn't always please the adoption agencies, though the birth mothers made me their heroine.) In Breathe, I had little things to research. what exactly do you see on a sonogram at 16 weeks? What happens if someone dies out of state? I found a great cop to talk to (thank you, Clea!) and I had help from friends (thank you, Leora!) but when I needed to find out things about funeral homes, it got a little tricky. I was able to talk to a great person in NY, who then told me how radically laws can differ state to state. So I put out the word to people I knew on Facebook (and got one terrific funeral director) and called two places in Mass, where I need the funeral home to be. One of them was coldly silent and said no one could talk to me. The other said, yes, ask away, and when I did, a question about autopsy, there was that funny cold silence again, and he said, "I don't feel at all comfortable discussing this with you over the phone, goodbye." And he hung up on me! Just like that! Lucky for me, I was able to find what I needed online and from the funeral director. The thing I do love about research is entering someone else's world. After my 1950s novel, I am writing one around coma and I already found my neurologist to talk to and have pages of notes. Still, I wish that "the more you know, the less you realize you know" would not be such a common thing in my world. I know a lot of writers who map out their novels. (I do know some writers who follows the pen, but to my mind, those books have a certain inbred formula or genre.) John Irving knows every single thing that happens. I am a big believer in Truby story structure myself. John Truby is a screenwriting guru who watched hundred of films to see how they worked, how they didn't work, and what makes story. He threw out the three act structure which is too static and came up with tools like psychological wants and needs and desire lines and moral choices--and it is all invaluable stuff for a novelist. Get Kids to Love Reading: Behind The Book Works! Jo Umans is the wonderful executive director of Behind the Book, a literary arts nonprofit that promotes literacy and a reading culture among low-income students in New York City public schools. Their mission is to excite children and young adults about reading. She was gracious enough to let me pepper her with questions. How do you excite people about reading? And concurrently, how do you think you can kill a love of reading? Most of the kids with whom we work don’t read for pleasure. I think you have to find books that are of interest to the kids as well as authors who reflect the experiences of their readers. The book also has to leave a lot of room for discussion. One of the most successful books we work with in high school is called, Like Sisters on the Homefront by Rita Williams-Garcia. The story is about an urban teenager who has a child at 14 years old. Her mother sends her down south to live with relatives in a stricter environment where she learns a lot and grows up. I am NOT doing justice to the plot. But we had one group of students disagree with the ending so we had them rewrite it. We have had other groups reenact sections of the book, and the art projects in relation to the story have been fantastic. The book is now part of the 9th grade curriculum at one of our schools. Another book that’s great for some high school classes is called Tyrell, by Coe Booth. The story is about and told by a 16 year old boy who is living in a homeless shelter and taking care of his mother and little brother. Kids have a lot to say about Tyrell and his experiences. Both of these books are written beautifully, I might add. It’s much easier with the elementary school kids because they haven’t had as many bad experiences with reading and books. They’re also more open to new experiences than teenagers. Also, for any age group, knowing that they will meet the author and be able to ask questions is a huge motivation. Kill a love of reading…hmmmm…. choose books that are too difficult or too easy might do it. If you give a 10th grade student a book that is at 3rd grade level, even if he or she is reading at that level, it’s humiliating. That would definitely kill it. Another way is to have a teacher who is not enthusiastic about the book teaching it…Kids are smart and if their teacher doesn’t like it, they probably won’t. That’s why the teacher makes the final decision on the books we work with. The teacher has to live with the book for a few months so we ask that they read the book before deciding. You bring authors' and their books into classrooms, which is a superlative idea. Are there certain books and authors that work better than others? Do the kids have a choice? How do you fit the book into the teacher’s curriculum? I think I answered that above…but I love to look around the classrooms and ask teachers which books are the most popular. We also ask the teachers to get input from the kids. As we all know, a good book isn’t all it takes for a successful exchange. The author has to be interesting to kids. Some of the best we’ve worked with include Doreen Rappaport, Andrea and Brian Pinkney, Brian Selznick, Mo Willems, Rita Williams-Garcia, Gail Carson Levine, and Tony Medina. We’ve had kids sing with authors and even meditate. We worked with a special ed class of 4th and 5th graders and the author, Katherine Leiner, wanted to take the kids through her process of preparation before writing. The teacher was skeptical, as were the staff, but when it came down to it, the kids LOVED it. Katherine brought the bell, pillows, incense and the poetry that came out of these kids blew us all away. When we walked in for the second visit, the kids were begging to meditate …pretty cool. 3 . What has the feedback been like from kids? Does this go from kindergarten to high school? Is it more successful in certain grades than others? It’s equally successful, I’d say, with all grades…in different ways. Middle school teachers associate Chris with books and when she goes into a classroom the kids who’ve worked with us are most cooperative, excited, and ready to work. Word of mouth is powerful so we’re mostly well received. In a few of our schools kids will tell authors that their book is the first one they’ve ever completed. It’s sad but gratifying to hear. Did I mention that for some kids, the books we give them, are the first they’ve ever owned? And they always get autographs…which they love. W What can the average person do to help your organization? We have a waiting list of 14 schools right now and can’t possibly get to them all in the next year. What makes our programs work is the individualized attention our staff gives to each teacher and to the authors. Authors don’t generally do their pre-produced presentations but have to tailor them to the needs of the students. It takes a lot of time to put together each program. We create new programs to go with the skills of the author as well as the needs of the teachers and students. We go to all visits and act as stage managers at each one. Therefore we only do about 100 visits a year. All that being said, we need more money to insure the effectiveness of our programs. But…we do a lot of events…and I’d like to invite your readers to come and learn more about us. Today we have a rooftop networking party for young professionals at the Roosevelt Hotel and in July we’re holding a dog party in Central Park with Bill Berloni, the dog trainer who trains animals for theatre, film, and television. He will bring some of his dogs and show us how he works. We’ll also have Frosty Paws for the dogs and the Humane Society will be there will adoptable dogs. Sign up for our facebook page or email us to get involved at www.BehindtheBook.org. We also work with volunteers in classrooms and we’re always looking for photographers, web site writers & input–ers, public relations people, and data analysis volunteers. If you have a unique skill and want to help us, we will find a way! 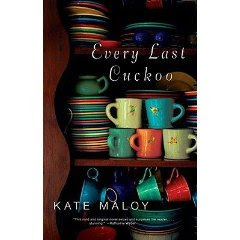 Kate Malloy, the author of the wonderful Every Last Cuckoo has a fabulous post up at Kepler's Writers Blog, my new favorite place in the world. Please go read--and post a comment. Sigh. It is an old argument and I wish it could be put to rest. Personally, I prefer my books dark, thorny and full of interesting characters, and what is more interesting than the drama of human relationships? On that grumpy note, I am going back to writing. It is dark. There is violence and a mystery of sorts. It is set in the 1950s. And it involves the drama of family relationships. This is from the fabulous Cari Luna. Spread the word, donate, enter. Remember a while back when I told you about a wonderful project that I’m fortunate to be a part of? The Afghan Women’s Writing Project is doing good, good work. It is giving young Afghan women an outlet for telling their stories–important stories that would not otherwise be heard. I know times are incredibly tough right now, but I’m asking that you please consider making a donation to the Afghan Women’s Writing Project. Information on how to donate can be found here. Once you’ve made a donation, please email me here(awwp[dot]raffle[at]gmail.com), and let me know the amount you’ve donated (which will remain confidential). Every $10 US (or equivalent) donated will earn one entry into the raffle. I will use a random number generator to choose the prizewinners at 10pm PST on Friday, July 10th. • Susan Choi has donated a signed hardcover edition of her novel A Person of Interest. • Featherproof Books has donated a signed trade paperback original of Hiding Out by Jonathan Messinger, and a one-year subscription to Paper Egg. • Masha Hamilton has donated signed trade paperbacks of her novels The Camel Bookmobile and The Distance Between Us. • Caroline Leavitt has donated a signed hardcover edition of her novel Into Thin Air. • Donigan Merritt has donated a signed hardcover edition of his novel Possessed by Shadows, and a signed trade paperback original of his novel The Common Bond. • Ernesto Mestre-Reed has donated a signed 1st-edition hardcover of his novelThe Lazarus Rumba, and a signed trade paperback original of his novel The Second Death of Única Aveyano. • ml press has donated a 6-month subscription to their chapbook series. • Sara Shepard has donated a signed 1st-edition hardcover of her novel The Visibles. • Tin House has donated a one-year subscription to their literary magazine, and a bundle of books from their New Voice series. • The Verve Music Group has donated 2 signed copies of Diana Krall’s latest CDQuiet Nights, 1 signed copy of Melody Gardot’s new CD My One and Only Thrill, 2 copies of the four-CD box set The House that Trane Built: The Story of Impulse Records and 2 copies of Ashley Kahn’s book of the same name. Pretty cool, yeah? Please donate. Spread the word. Enter! I am at the stage now where my novel is not listening to me. It has a mind of its own. It veers and turns and twists. It avoids looking me in the eye. A character I meant to stay a kid is suddenly 19 and working as a fry cook. A man I meant to be a peripheral character is stunned to discover his part in a terrible crime many years ago. I know this stage is the big mess stage, and it's fine. I am not one of those writers who can either "follow my pen" or adhere to an outline. It all breathes, in and out. In the meantime, we visited Williamsburg, Brooklyn for the first time. It used to be full of all Orthodox Jewish people, but now it is all young hipsters. It was sort of jarring because it reminded me both of Harvard Square and parts of the old East Village, except, except..everyone was in their twenties. Their young twenties. I felt too old to be there! There were people selling their used clothes on every corner, kids bopping on the street or spilling out of apartments. Great shops, restaurants, bookstores, but the vibe was decidedly college. It was the first time I had ever visited a part of NYC where I felt, nice place to visit but I could not live here. I'm too old! Interestingly enough, the NY Times had a piece about Williamsburg, how it is considered terrible among the culture there to have to take money from your parents to afford the high rents there, but how else can starving artists pay $1500 to $3000 a month? Of course vibes change. My beloved Soho is now bankers and models. Hoboken when we moved here was filled with artists and writers and we were all pioneers in a gritty city, but now it is gentrified. I love the restaurants and shops and cultural activities. I love the city buzz. What I don't love are the bankers and beefy jocks who like to drink too much on the weekend. I'm not fond of the too many posturing kids who are too timid to get thee to Manhattan but still want to hang out somewhere urban. But that vibe, too, will pass. In my twenties, I married-a horrible first marriage, but we had such separate lives that it was not so traumatic to me to be part of a couple. We lived in an apartment and I never cooked--or cooked very badly, and when the marriage broke up, I fled. Enter my thirties. Maybe biology kicked in. Maybe I changed. Maybe I just grew up. Suddenly, I started noticing babies everywhere, and to my great surprise, I could not look away. Suddenly, I wanted a child. I fell in love and married--happily this time, and could not wait to have a child. But Jeff wanted a home, first. We couldn't afford the three or four bedroom we would need in Manhattan (we both needed home offices), so we looked in Brooklyn and Hoboken at the then affordable brownstones and brickstones. And we found one! But I couldn't call it a house. Not then. And the thought of leaving Manhattan--even to be 10 minutes and one subway stop away-- was crushing. Of course, things changed. Our refrigerator is filled with food from Whole Foods or Garden of Eden. I love my house (there, I said it), and I love being a mother so much, I wish I had done it years earlier and had a whole houseful of children. My son is the most profound experience of my life. I love being a wife! My life is domestic--the one thing I thought I would never want--and now the one thing I DO want. When I wrote about this for a glossy magazine, the editor phoned me, distressed, and said it was "too pathological a piece for her readers, too upsetting." I was a little taken aback, but then I thought, well, it must have gotten to her a little for her to call me to want to talk about it, right? Sitting with Liza yesterday in Sweet, my fave cupcake shop, we watched a bevy of little girls dressed up in costume. We both talked to them and their moms and watched them choosing cupcakes. We talked about our homes and our husbands and our work, and I felt this pure happiness. Who would have thought this would be me? Ron Hogan is the writers' friend. He's been working to put together a new writers' conference with the Center for Fiction in New York-- -- a conference that deals specifically with the issues that writers face AFTER they've created a great story and found an agent who can help them sell it to a publisher. In this rapidly changing economic climate, it's as important for authors to know about the business side of publishing as it is about the artistic side of writing, so, with generous co-sponsorship from Fordham University's Creative Writing Program, he's created a one-day conference filled with panels designed to immerse people in the practical side of the publishing industry. The event will be held on Saturday, June 27, at Fordham College at Lincoln Center. In addition to all that, the Center for Fiction is giving attendees a free month of access to its writers' studio in midtown Manhattan, plus a discount on future membership. And the total cost is just $200. If you--or you know writers in the greater New York City area who are at a place in their careers where a conference like this might be useful, spread the word! Right now, while waiting for the page proofs of Breathe (page proofs! ), I'm in the middle of a first draft of a new novel, which has no title. Sigh. I am notoriously bad with titles. My first novel had a title from the short story, Meeting Rozzy Halfway. It just fit. Then, being ridiculously superstitious, I had a spate of three word titles, Into Thin Air, Living Other Lives. Some titles came because of associations. Family was from a really old television show of the same name. Coming Back to Me was a loving nod to my husband, whose book on the 60s and the Jefferson Airplane (Got a Revolution) had just won a prize. But this new novel is still stretching its legs. I'm not sure of the real meaning of my story yet because I am still in draft one. But I will say, I am newly in love with single verb titles. How does anyone else figure out their titles?